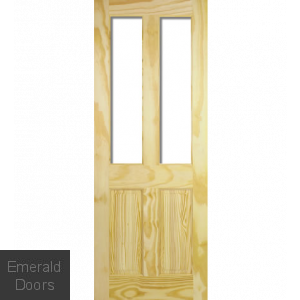 Emerald Doors offers you an amazing collection of Internal doors with furnished and high-quality wood. You can give traditional to rich look to your interiors with our wide variety of doors. Let us give you a walkthrough to Pinewoods, the best of our collection. 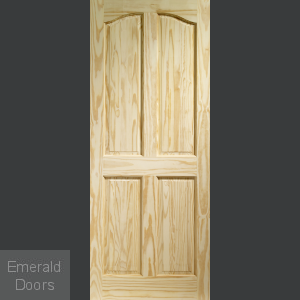 If you crave for a pine perfection for your home or workplace, look nowhere else than Emerald Doors. 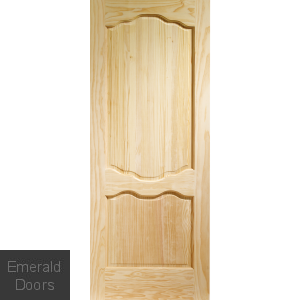 Emerald Doors is the leading supplier of Pine Doors in the UK. It stocks the widest range of traditional and contemporary designed pine doors. Pine doors can be your perfect choice. If you are transforming your old home or revamping your old office. These long-living evergreen trees are native to the Northern hemisphere. Pine has sort of distinctive wide-grain patterns. It has certain irregular flaws and knots that give a unique design to the interior pine doors. Also, Pinewood has color variations ranging from light to dark, and that makes it better than the other woods. Ideally, it is suitable if you are looking to paint your doors to complement your interiors. But when it comes to durability, oak outstands pine due to its high resistance to humidity and water. Not all pine trees are of the same species; they vary in grain patterns, knots, growth rings, color, and shape. As a result, each species and each board comes with the uniqueness of color, texture, and beauty. Due to such unique features, Pine has become a primary choice for interior designers and homemakers. Emerald has an extensive collection of Pinewood with styles that match your interiors and your demands. You can choose from traditional to classic styles. 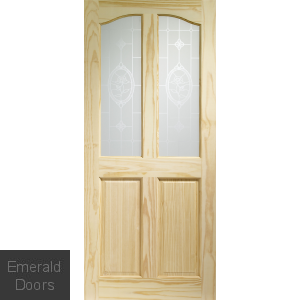 For instance, the clear pine 4-panel door has four large panels to give a classic Victorian touch to your decor. 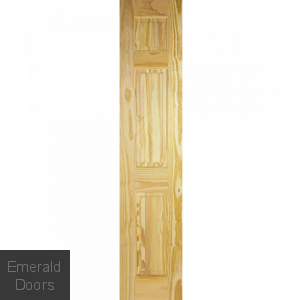 Emerald Pine doors are made of pine softwood which comes from the conifer trees. It is both durable and inexpensive. Thus, they are the first choice for the shipbuilding industry. It is easy to work with as it is highly sound and noise resistant. Unlike traditional hardwoods, these are available all-year round as they are grown in plantations. It is available with horizontal panels that add a quotient of contemporary style to the doors. One can add glass panels to the doors to allow the light passing giving exposure to natural light. Inexpensive: Generally, pine doors cost lower than other varieties of expensive hardwood. From budget homeowners to the landlords, it is suitable for everyone. Easily Paintable: Give your home or office space an entirely new look and style with the unfinished pine doors. Paint these with a variety of different colors to match your home or office decor. Unique Look: Pine doors give a unique look to your home or workplace. They can go along with traditional types of houses or the eclectic ones. Sound Resistant: Pine doors can help reduce sound transmission throughout the room. This is beneficial for houses with multiple bedrooms recording studios and theatres. Colour Variants: Pinewood is naturally light in color. It blends beautifully with a wide range of paints and color schemes in the home. If you prefer a translucent color or dark brown, you can take satin. Pick any color scheme, and it will still allow the grain to shine through. 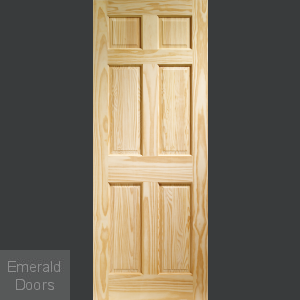 We offer an exquisite selection of Pine doors at Emerald for our valuable customers. The purchasers can select clear and semi-clear pine doors to make a style statement or keep it classy. The Scandinavian style knotty pine doors from our collection can be a perfect fit within any living space or country kitchen. 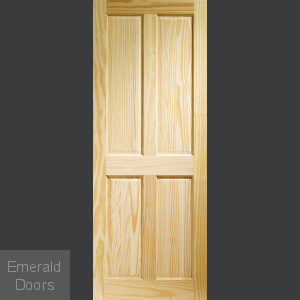 Our Glazed Pitch pine doors can add a touch of drama to complement every interior. The Pine doors from Ponderosa Pine wood come with straight grains with red-brown color. It is not that strong and hard. However, it is great as it has a moderate shrinkage characteristic. Pine Doors are constructed from solid wood. To ensure durability and longevity, we veneer our pine doors. Doors can then be painted, stained or waxed as per customer’s preferences. You can easily find the door or doors of your dreams with just one click. Just choose the door of your choice by leveraging our quick shopping cart.